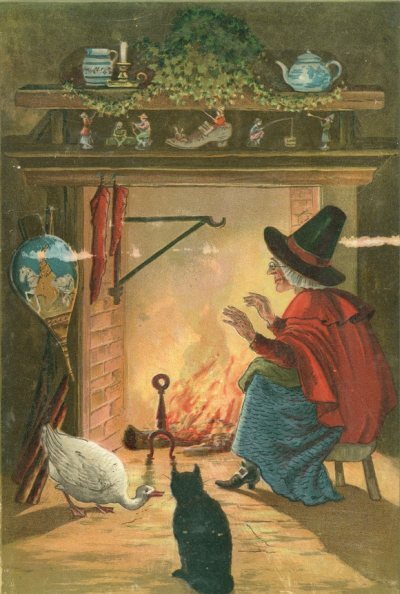 Although this picture came from a children’s book about Christmas, we thought the lady pictured here looked more like a friendly witch, so we put it with the Halloween images. She sits quietly warming her hands in front of the fire in her hearth with her black cat and duck sitting nearby. The figures on the hearth look as though they could be lively little sprites. Overall, this full color, vintage image is in the public domain, downloadable and ready to be used in your next creative project. The illustrator was not identified but the author was Clement Clark Moore (1779-1863) using the penname of Kriss Kringle. The book was Christmas Rhymes and Stories: original and selected. Including a Visit from Santa Claus from 1884.